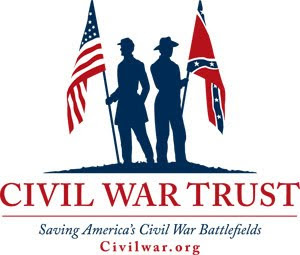 As many of you know, I've been reading a great deal about Confederate cavalry in the east in preparation for my own history of the 39th Battalion Virginia Cavalry. Recently, I picked up Steve French's Phantoms of the South Fork. 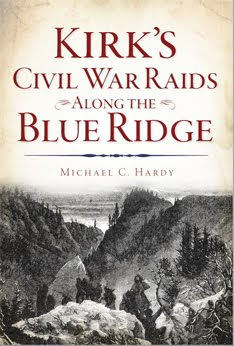 French's work covers the partisan war in the lower Shenandoah Valley and in Hardy County, and surrounding counties in West Virginia. McNeill's Rangers were originally under the command of John H. McNeill, until his mortal wounding in November 1864. Command then passed to his son, Jesse McNeill, who held sway until the end of the war. 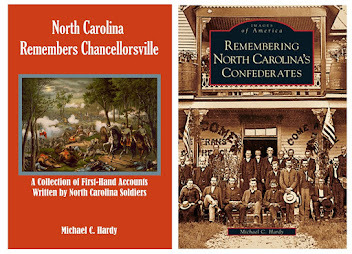 McNeill's Rangers was only one of two partisan bands to escape the purge by the Confederate government in February 1864. Mosby's Rangers was the other group that survived. The authorities believed that partisan groups caused more damage than good and rolled many of them into regular regiments, much to their chagrin. In many cases, the partisan war was personal: soldiers were literally fighting in and around their own homes, and at times, were fighting their own neighbors. Their most effective work was to ambush supply trains destined for far-flung Federal outposts, depriving Federal soldiers of supplies. At other times, they waylaid small detachments of cavalry soldiers and, later in the war, trains. Often, the partisan groups would rob civilians as well. 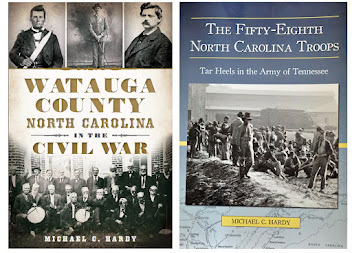 The comparisons to some of my own work with the partisan war in the mountains of Western North Carolina and East Tennessee are uncanny, although the Federal and Confederate actions were more organized in the area where McNeill's men were fighting. 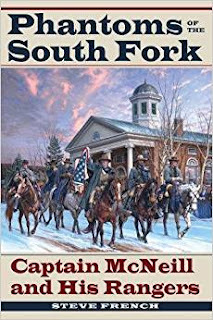 Quite possibly, the most famous episode for McNeill's Rangers was the night in February 1865 when the Rangers stole into Cumberland, Maryland, and captured Maj. Gen. George Cook and Brig. Gen. Benjamin Kelly. Overall, the book is a good read, although at times I had trouble keeping up with names. The FPhantoms of the South Fork is a good addition to your library. A few weeks ago, I wrote a post asking about who carried Robert E. Lee's headquarters' flag during the war. The short answer was "whoever was assigned to Lee's courier group for a given day of campaign." To backtrack just a little, at Cedar Mountain, Jackson was trying to rally his broken left. In the midst of the battle, he seized the colors of a nearby regiment (possibly the 21st Virginia), and cried "Jackson is with you!" A couple of thoughts: where were Jackson's flag and flag bearer during the time? Is the flag the one that Bob Isbell is carrying? 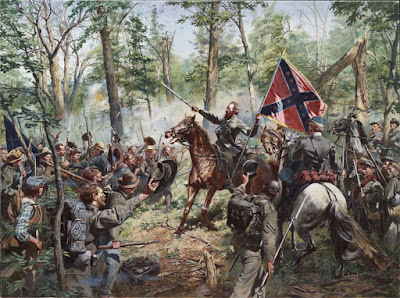 On the other hand, Jackson probably grabbed the regimental flag, trying to rally that particular regiment. 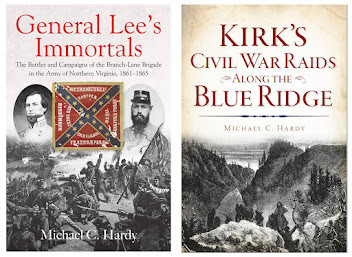 Since taking on the 39th Battalion Virginia Cavalry project, I decided that I needed to immerse myself in the history of the cavalry in the Army of Northern Virginia. So for the past seven or eight weeks, all I have read has been tied to that fabled group of cavaliers. 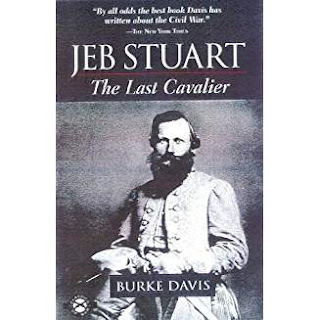 My exposure in the past has been limited to Burke Davis's JEB Stuart: The Last Cavalier, which I read when I was young, Fighting for General Lee: Confederate General Rufus Barringer and the North Carolina Cavalry Brigade, Thomas' Wade Hampton's Iron Scouts, and whatever I picked up while reading Freeman's Lee's Lieutenants, Glatthaar's General Lee's Army, or the numerous books on various battles fought in Virginia, Maryland, and Pennsylvania. 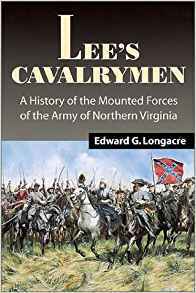 Looking through the bibliography of Longacre's Lee's Cavalrymen: A History of the Mounted Forces of the Army of Northern Virginia, it is quite clear that there are quite a few accounts written by the cavalrymen themselves. Those accounts are always the most important. I enjoy hearing from the soldiers themselves. 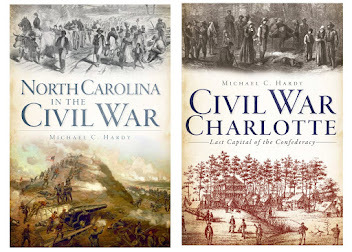 Blackford's Letters from Lee's Army is a fantastic account from a member of the 2nd Virginia Cavalry. About half way through the war, Blackford transferred to staff duties under Longstreet, so his accounts on cavalry operations are limited (But an interesting book none the less). 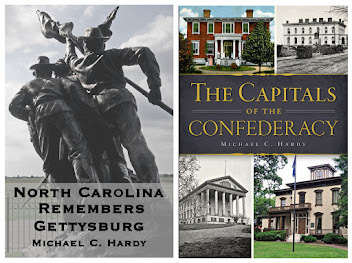 On my too-read list are Myers' The Comanches: A History of White's Battalion, Virginia Cavalry; McDonald's A History of the Laurel Brigade; Keen-Mewborn's 43rd Battalion Virginia Cavalry; French's Phantoms of the South Fork: Captain McNeill and His Rangers; Trout's with Pen and Saber: The Letters and Diaries of JEB Stuart's Staff Officers; and maybe Werts' Cavalryman of the Lost Cause. As you can see, there is a mixture of old and new titles in this list. I'm sure I'll probably add a title or two before it is all over. 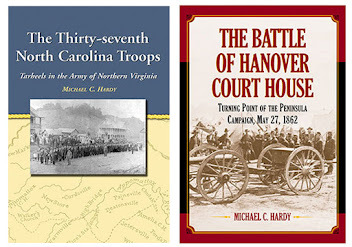 So, what are some of your favorite books on the mounted arm in the Army of Northern Virginia?